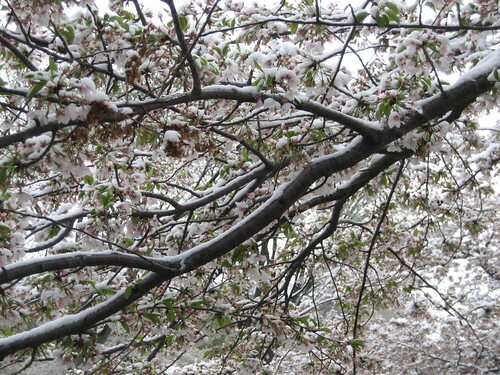 We got a rare April snow today, leaving a dusting on the cherry blossoms for the National Cherry Blossom Festival. See all my pictures from around the Tidal Basin. Zoom in three levels for optimal effect. Boo to Canon for not having a way to check battery life on their cameras. I’ve had five generations of their PowerShots and they haven’t fixed this yet. I ran out of juice and had to keep fighting the camera for One Last Shot. Good thing I did – this shot of the Jefferson Memorial framed by cherry blossoms is one of my favorites. Other pictures from my recent skiing and hiking: Vail, Upper Hawksbill trail on Skyline Drive and the Ridgeline Trail in Massanutten. I’ve noticed as I’ve been geotagging more and more pictures that Yahoo!’s satellite imagery in remote areas is much better than Google’s. Vail looks like a big blob on Google, but you can pick out the lifts on Yahoo. Google’s imagery was also worse for Massanutten. This entry was posted in flickr, google, gps, maps, yahoo. Bookmark the permalink. this is a fantastic shot..